Haiti’s health system continues to operate in a fragile state following the earthquake of 2010, the subsequent cholera epidemic, and the presence of a myriad of donor programs with limited incentive for coordination. Finite domestic resources and governance volatility only serve to make the situation more complex. The governments of the United States and Haiti have agreed to a Partnership Framework to strengthen the Ministry of Public Health and Population’s (Ministère de la Santé Publique et de la Population or MSPP) stewardship of the health sector. Since 2013, the HFG project has supported the USAID Haiti Mission in achieving its goal of supporting the MSPP to be better equipped to exercise full authority and effectively oversee the country’s health sector. In Haiti, HFG operates in tandem with MSPP’s dynamic, overarching strategy for the implementation of its Ten-Year Health Plan (Plan Directeur de Santé 2012-2022 or PDS). The PDS prioritizes achieving increased access to health services, especially for the poorest and most vulnerable. HFG plays a major role in the ongoing development of Haiti’s national health financing strategy. The development of a health financing strategy will support MSPP’s efforts to identify, mobilize and utilize financial resources to enable universal access to care for the Haitian population. In 2015, HFG spearheaded an international conference, “Access to Health Care for All in Haiti: Challenges and Perspectives for Funding,” to engage key global and local stakeholders and create the push for formalizing Haiti’s health financing strategy with the included goal of universal health coverage. HFG bridges the collective efforts of the MSPP and development partners including the World Health Organization and the World Bank in the ongoing development of this strategy. 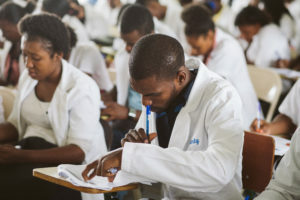 The project also supports the complementary USAID/Haiti priority areas of human resources for health (HRH) management, health financing, public financial management, and governance of the health sector. Peterson Larrieux focuses intensely as he completes a questionnaire during a training session. Image by Valérie Baeriswyl for Communication for Development Ltd.
An operational procedure for rating the quality of the initial education of health workers in the private sector, developed with the contribution of the Canadian Association of Schools of Nursing. HFG also works to strengthen the public financial management capacity of the MSPP. This includes the preparation and execution of budget processes, as well as the improvement of public investment planning and resource tracking. The assistance improved the MSPP’s capacity to produce National Health Accounts (NHA)—an important advocacy tool for mobilizing more resources for health. The MSPP is now equipped with the technical competence to regularly update its national data on health expenditures in accordance with international standards and regulations, leading the production of the nation’s fourth NHA exercise. Another key objective is institutional strengthening. HFG provides vital institutional support to the MSPP aimed at the organizational restructuring of key departments. This organizational strengthening process is intended to improve the essential functions in key departments, thus enhancing the MSPP’s overall capacity to effectively manage and coordinate the health sector. Since 2013, HFG has conducted costing studies and developed business plans for several health institutions in Haiti. The project works with institutional leadership to better enable them to both ensure sustainable funding for health service delivery and enhance the sustainability of USAID’s infrastructure investments. HFG will strengthen the capacity of the MSPP to carry out these exercises to improve financial reporting at public hospitals.